After going to see Novella of Farm City fame last week, my husband announced that he wanted to turn our front lawn into edible landscaping. Now, it should be no surprise to you that I've wanted to do this to our front yard for years, but didn't think he'd be game for the work that would go in to it. 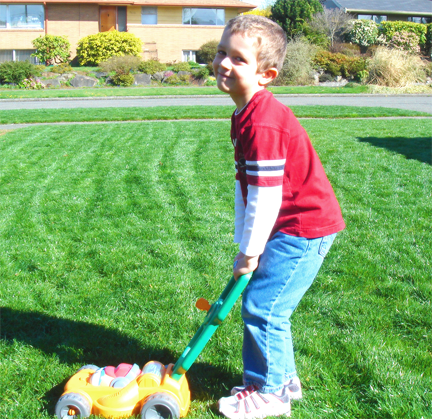 However, he hates grass and our front lawn is not exactly the most beautiful turf in the neighborhood, so it shouldn't be much of a surprise (this picture is from March 2007 and the lawn is much less grass and more other things since then). Other neighbors have removed their lawns, but I can count on two fingers the number of houses in our community that have any kind of edibles growing in their front yard. Okay, make that 1 finger. So, I've always been loathe to do what I really want out front. Our backyard is another matter, and it's turning more into raised bed central although we still have more grass than beds. In either case, my husband is really getting into it and ordered a book on the matter. We have a couple great landscaping companies in Seattle than specialize in edibles so we'll probably be consulting them for design decisions otherwise we'll most likely end up with rows of raised beds. What about you? Do you grow food in your front yard or do you keep it to the "safety" of the backyard? I'm renting, so my "front yard gardening" is limited to (this year) window boxes of beans and peas on the porch, and picking the dandelions. But a house a couple of blocks away just put in two nice raised beds in the front yard. I have a patch of spinach in my front yard. We filled in a hole some dog dug and instead of going out and buying grass seed to put there (the yard is 90-some% weeds anyway) I dumped out a pack of spinach seeds and told 'em to have at it. I say go for it, especially if your husband is on board! I realised that most of my herbs are in the front yard. Dad and I planted them a while ago. I am planning a herb patch in my front garden. I already have a rosemary bush to one side of the front door, and am planning to plant other herbs on the other side, so I can just nip out and pick some when I want them for cooking. I have asparagus in the space between the sidewalk and the street, and just harvested some fresh spears. I also have rhubarb, red currants, blue berries, garlic and space to plant other annual vegetables done either by digging sod (not fun) or sheet mulching (much easier). I have plans to put in additional fruit (lignonberries and pilgrim berries) right next to the sidewalk. I suppose I could use a plan but just put where the garden space would have the best sun even as the trees I planted grow. @Oxray--I can empathize with the "wierdo" thing. When we lived in Austin our neighbors could not understand why we replaced the turf with edibles. That was until they saw a broccoli plant for the first time in their lives and tasted the sweetness of carrots plucked right before their eyes. Initially shunned for our eccentric behavior, the garden evolved into a community space and we got to know more neighbors (in a good way) because of it. I think it is lovely. We still have a ton of grass, but at least this gets some of the gardening out in a public, sunny spot, and it has sparked some (good) conversation with the neighbors. Our main veggie garden is technically in the front yard, but as it's on the side of the house, we built a little decorative fence with a gate, so it seems more like a side yard. We have mint and raspberries in the front as well. Oh - also, I asked for "Edible Landscaping" by Rosalind Creasy for Mother's Day - if I get it, we'll have to swap reviews. We've only got fruit and some colorful swiss chard in our front yard at the moment, but with my quest to eradicate 90%+ of the grass on our lot, it's only a matter of time. My hope is to have the front yard end up as a mix of fruiting plants, herbs, and a few other interesting looking things (quinoa, amaranth, more chard, etc.) I get the impression that most neighbors care more about a garden being well-planned and nicely-kept than about what you're growing in it, and that with the exception of a few things like corn, many people don't actually recognize food plants as such. I've got blueberries making an edible hedge/fence along one property line in the front yard. I also have an apple tree out front. Things like this blend in easily with "normal" landscaping. Such a tempting, flat space! You could do so much - depending on time & effort available. It will only look better the more veg and less grass you leave. We have a beautiful picket fence and a growing collection of raised beds around the perimeter of the front yard. I kind of love the very subtle In-yo-facedness of front yard gardens. I don't know if I could do it without a fence, though. One of the community gardens here was pillaged in the night right before harvest and it made me realize how something simple like a fence can be a great deterrent to miscreants on the prowl for organic treats. Plus, our backyard is a desperate, feral place full of cover crop, crabgrass, and decomposing straw. It cries out to us in the night..."Till me up. Add more dirt. Plant things. Bring me tomatoes and green beans..."
Sounds like a good topic of conversation for your next community group meeting. One of the ways early anti-lawn folks got in trouble with their neighbors was because they did it in an "in your face" kind of way. And of course it doesn't have to be. If you can bring it up at a meeting, the neighbors won't be surprised (good), and some of them may let you know what they might object to (I hate those cheesy tomato towers!) - and you might find ways to work around it. And- you might recruit a neighbor or two - to help in your lawn make over; or to make their own lawn over. When I lived in town I grew herbs and vegetables in my front yard because I hated mowing the grass. I eventually had most of the little yard in edibles along with some flowers. The backyard was too shady to fool with. I was inspired to do this by reading about actor Eddie Albert, social and environmental activist who promoted organic gardening, who grew corn in his front yard. I think this goes back to the '70s when I first heard about it. There's a great book that you might like called "Food Not Lawns" by Heather Flores that you might like. It's helping me slowly transform our yard into something more useful. Well, given that we're on an acre in a semi-rural area, we don't really have a typical front yard. Some of our neighbors do, but many have houses placed at angles or way towards the front (or back) of their acre so the yards end up indistinct. That said, we do have a clearly fenced small yard that could be called the "front yard." It is where the most intensive vegetable gardening is being done because it is not subject to the ridiculous zoning restrictions we have to deal with. It's a container garden for now but will morph into raised beds by next year. Do the neighbors think we're weird? Don't know and quite frankly don't give a f*ck. In the past, I grew strawberries down the strip between my driveway and my neighbor's driveway. They are pretty and the my girls and the neighbor girls loved picking and eating them. I would also like to get rid of the lawn and do more edibles. Our front yard is small but I am thinking a fruit or nut tree and maybe adding a fence down the side for some berries or kiwis. I visited a friend of a friend who had multiple nut trees, olive trees, persimmon trees, and grapes in their front yard (growing up the fence into the side yard). It is far lovelier than any lawn. This year I have planted vegetables in all my flower beds. I couldn't bare to part with my bulbs, they are so expensive, and just starting to grow here in South Dakota, so I just planted my asparagus around them. I will have flowers in the spring, and food soon after! I also tore the bushes out of my landscaping in our front yard and planted blueberry bushes. All in all I will have peas, onions, asparagus and watermelon growing in the visible, unfenced in areas of my yard. I also have all kinds of herbs growing in pots near my front door. Why not. My neighbors already think I am crazy, with my rain barrels and push mowing. May as well give them one more thing to talk about! Our garden is in the sunniest and lowest spot in our yard which just happens to be in our front/side yard, right in a corner lot on a through street. Lots of people walk by and there's been lots of conversations about our garden while we were working out there. We once had a lady run over our mailbox with her car. She apologized and said she was admiring our garden! I don't live in the city anymore, but when I did - in Ballard, close to you, I think - my front yard sported a Bing cherry tree (which people were always filching from), a plum tree, a pear tree, a grapevine, and several culinary herbs like rosemary, mint, sage, and thyme. In Seattle, I've always seen many homes with edibles in the parking strip or the front yard. Frankly, it never even occurred to me that it would be any kind of issue. Aimee - Well, if I lived in Ballard proper or, frankly, across the street behind our house, it wouldn't be a problem. But, we live in a neighborhood with covenants and lots of rules, so it could be a problem. Love it! At my old house, all of the sun was in the front yard. Therefore, that is where all the veggies had to go!!! I got so many compliments and everything grew like crazy. I interplanted with flowers - to attract pollinators, to repel pests (namely the random deer patrolling our street) and to make it look pretty. Front yard farming also opens you up to your whole neighborhood. It inspires others, strikes up conversations, spurs the exchange of recipes and, oh, I do miss it!! I miss it so much that even though I'm still chipping away at the huge sunny expanse that is our current back yard, I've stuffed a couple herbs in the shadier front - just for old times sake! Happy planting. I would definitely advise you to just do raised beds. You don't even have to pull out your lawn! Just put your raised beds right over the grass. You will kill out the grass underneath them, save your back, and have a nice gassy pathway between the beds to boot. Just make sure they are deep enough to kill the grass, about 10-12 inches high. Otherwise the grass might not be properly snuffed out. If your lawn is really just a weed patch like mine was, you do have to remove the weeds, rototill, compost and plant away! I love front yard gardens so they can shock and inspire people passing by, and backyards for their privacy and peace. I say plant both...fruit trees in one and the garden on the sunniest side. My front garden is a bit of a mish-mash at the moment. It has a small Medlar tree (which I've just noticed is slightly lopsided- I have a horrible feeling the neighbours children have been swinging on it. Must have a word...) and a mix of ornamentals and edibles; there are a few herbs, the mangetout/snow peas a couple of shrubs, some herbaceous perennials, some climbing roses and a very tatty small area of grass. The non-edibles in my garden tend to be fragrant/good for picking (I like to give posies of flowers as gifts or put in the house- no plastic and zero flower miles), good for insects and/or medicinal. I wouldn't mind losing the grass completely, but the children park their bikes on it, off the path (we live in a small cul-de-sac, so it's safe enough for them to ride their bikes up and down the street) and put up swing-ball, etc. I'm tempted to put up a low edible hedge, but I'm worried that they'll just trample on that too. We began gardening in the front yard last year - winter squash plants (self-protecting against animals). We live in a rental house - it has a fenced front if the driveway gate is closed which it never is. This year, we scavenged bed-sized cardboard from a truck delivering across the street and sheet mulched a large discontinuous piece of grass, about 500sf, killing the grass then tilling it last fall, replacing the cardboard and covering it with free-harvested horse manure and a layer of municipal compost on top to minimize any manure odors. It was an eyesore all winter, but what the heck. Now it's just gorgeous and waiting for tomatillos, tomatoes, sunflowers, and corn or pole beans or both. We plan to make a sign that says "More food, less lawn" and hammer it in the front of the bed. We still have quite a bit of lawn in the front, maybe 1000sf, that we will leave alone because we still have three kids who love to play outside and use the space heavily. We water it with kitchen greywater (captured from food washing) and when the kids play in the sprinkler - the water always has a second use than just lawn upkeep. For any yard space that adjoins a street, it is important to have a buffer zone of plants that you do not eat which are trapping toxins from exhaust. But you may know that already. We have city owned sidewalk right to our front door so not an option but the owners of the corner building close to us(also an art galley) grew corn and tomatoes in a tiny patch of dirt last year. One of the owners/artists told me that she and her brother planted them in hopes that people would help themselves as they walked by- which I did but I think I was the only one! Seriously? NO ONE is worried about people stealing your food? Pumpkins on your front lawn, and they stay there? We had pumpkins in the back yard, behind three fences and a neighbor kid hopped the fences and stole them. Just driving home from a client's today and took a back way to my house through a small street and saw a home with cardboard laid across half their front yard! Yay. Sounds like someone I want to meet. ;) I'll be walking by there on purpose now to see what they do. re: food being stolen. I would expect fruit might end up in the hands of some kids but wouldn't expect much else to disappear. Okay, I'll discuss that fear, Dea-Chan. I'm not worried about the container garden vegs in the front fenced yard, mostly because people wouldn't know when the dogs might be out. They are big dogs, loud, and none too friendly to strangers. The fruit trees, however, yes, we do think about that. So far all of our planting has been towards the interior of our acre, but we've pondered planting blackberries along the wash. Do the bank stabilization benefits outweigh the probable theft of berries, despite the "No Trespassing" signs? Haven't decided yet. I certainly won't pay for berries to put there but if we end up with enough excess canes that we can get to root - maybe. Let me share a tale of my friend who lives in a nice neighborhood in town. She lives right across from an elementary school. Not only do people walking in the neighborhood steal from her trees, many of the parents dropping of their kids (while illegally parked in front of her house) do as well. Much of her yard is very narrow so she is not able to keep the fruit away from the sidewalk. But, she is the one who waters, fertilizes, and prunes these trees every year. Is it too much for her to expect to reap the benefits - the harvest - for her investment? The idea that any produce visible from the street is ripe for the taking is bogus. If you wish to share, put up a sign by your garden that says, "Help Yourself!" Sadly, in her neighborhood, signs saying "don't help yourself" are completely ignored. On the other hand, if one notices that fruit or vegetables are obviously not being harvested, I think it is entirely appropriate to ask the homeowner if you may harvest it, or perhaps suggest they contact the Food Bank or another non-profit group to harvest and share with the hungry. I've done both, with positive results. In fact, when I do harvest with permission, I make it a point to later bring the homeowner something made with their fruit, such as jelly or marmalade. This goes a long way towards instilling good will. Erica - Most likely that's what will happen, but I want our front yard to have some "street appeal". I don't need to stick out in our neighborhood more than I already do. And, I need to butter up the neighbors for the bees. Dea-chan - I would be worried about people taking fruit and tomatoes or peppers, but probably not a big issue with things like kale and chard. So, I would most likely concentrate on edibles that look more like "plants" and/or are things that aren't highly coveted. And leave the pumpkin patch and other things to the backyard. In other words, those things that I'd really cry about if someone swiped them. Mostly it would be the neighborhood kids that would be the problem. Although, I would like one of the beds to be dedicated for the Ballard Food Bank and I'd put a sign up stating this. Hopefully, this would keep grubby paws off the goods. I would be more worried about dogs pooping on it, which is why raised beds of some sort is desired. Plus, our native soil is mostly sand and a little clay. We are a little too close to Puget Sound + this neighborhood used to be a golf course. Our house must have been sited on an old sand pit. Anisa - Good luck with that grub hoe! here in Kentucky, I sneaked a tomato plant and some basil plants into my front flower bed last season. Planning to add even more edibles this year...if it ever stops raining long enough! I put a vegetable garden in the front yard three years ago, at the same time I planted two dwarf apples and a dwarf cherry tree. I also grubbed up the grass in the hell strip between the street and sidewalk to put in a strawberry bed. Not only is the garden pretty and productive, but my neighbors like to stop by to see what's new and sample the strawberries (with my blessing). So I say go for it! My 45 year old home and 45 year old landscaping are getting a facelift one project at a time. There are no covenents or restriction, but I do live inside the city limits of Puyallup WA. They designed a pet/animal (chicken's)ordinance that discourages anything that might be deemed a"nusence" to the community. On my cul-de-sac live mostly retired couples with no kids(no noise), no chickens(no noise), groomed weed-free lawns(no front yard fences)and time on their hands to visit the new neigbhor, me, and let me know how we do things around here. I tread lightly in my front yard. I love on line used book stores on rainy days when I can't wade in the muck of my garden. I want to share some excellent finds with you. "The Edible Ornimental Garden" by John E. Bryan & Coralie Castle, and "The Complete book of Edible Landscaping" by Rosalind Creasy. Also check out raintreenursery.com in Morton WA., they are having a clearance sale right now.